Want to know even more? Well, lucky me I was able to ask the founder of the event a few questions. HH: Thank you Ari Hershberg for taking time out of your busy schedule preparing for the first ever gluten free health & wellness festival to answer a few questions. AH: Thanks for interviewing me about the Gluten-Free Health & Wellness Festival. You have a cool blog. HH: First of all, what inspired you to put together a festival of this kind here in Victoria, BC? AH: I have a speaker agent background. I moved back to Victoria almost 2 years ago. I love this city and wanted to bring in big name speakers that people are passionate about, who usually only go to the big cities. I came up with the idea soon after a visit to the Pacific Rim College. They are an Alternative Medicine school in Victoria. Their three major programs – acupuncture, phytotherapy (western herbs) and holistic nutrition bring much insight to what gluten does to the body. How to help heal the gut and what modalities will bring balance to the body. It was suggested to me to take gluten out of my diet. After a few months I was shocked that my sinuses cleared up and that was just the start. My sinuses had always been congested and I thought that it was genetic. I started reading “Wheat Belly”, the New York Times mega best seller book by Dr. Davis and realized that he would be a wonderful speaker to bring into Victoria. HH: I see a fantastic array of topics have been arranged for this festival from gluten free awareness to digestion health to chi gong and yoga. What message are you hoping attendees of the festival will learn from their afternoon of wellness education? AH: The goal of the event is to go beyond all of the sound bites out there on gluten-free and educate people on gluten-free as well as the many other aspects that can put people in their best health. There are so many wonderful things you can do to improve your health. I wanted to make the event into a festival of possibilities. For example, Chi Gong is one of the most popular forms of exercise in the world and in North America the exercise is pretty obscure. This is an opportunity for people to look at so many different forms of health and see what they think in an open, friendly environment. HH: How do you see gluten free health and wellness today as opposed to say 10 or 5 years ago? AH: That is a great question and one I have thought about often. Pardon my Malcolm Gladwell reference, but Gluten-Free hit a tipping point about a year ago and now is a term that everyone has heard about. In Victoria it seems like every restaurant now caters to gluten-free. Prior to this tipping point, a small group of people who knew the term gluten-free were celiacs or people who went to their naturopath or Chinese Medicine doctor and was told to try and take gluten out of their diet and see how their body performed. There was very few people who knew about the term gluten-free. I would give the majority of the credit to Dr. William Davis and his book Wheat Belly. This book created discussion and is still creating discussion. HH: What do you hope to see in the future for this festival? AH: My biggest hope and dream for the festival is that it becomes a trusted educational event, where people come who want to take a day and learn. Through learning people who attend will feel comfortable, confident and even excited about their health and see how easy it is to make some minor adjustments in their health and the many health advantages they have from making these changes. I also want to create community. The opportunity to listen to phenomenal speakers in a live event creates discussion. This past year I was honoured to be the Media Relations Coordinator for TEDxVictoria. People love TED and TEDx talks and have favourite videos online that they have shared with friends. Being at the live event was different, during the intermission people gathered in the foyer and talked about different talks that excited them with friends and people they just recently met during the event. I would like to see the same at this festival. HH: As a health focused “foodie”, I have to ask, what are some of your favourite healthy snacks and/or meals? AH: It changes all of the time. For years I would spend a year or more mainly cooking a specific cultures food (Italian, Chinese, Indian). Lately I have been reading Sandor Katz, learning the Art of Fermentation and am all over Chinese soups again. My favourite soup right now is Corrine Trang’s “Cure All” Soup. It is a combination of fresh ginger, green onions, pork ribs, ground pork, daikon radish, fish sauce (I add fresh turmeric and kombucha squash) and fresh cilantro. I am going to have to go get groceries after I write this and make it today…yum! I like to cook from scratch and my meals change regularly. Cooking is my opportunity in the day to listen to great music and make wonderful food. HH: Lastly, what is health and wellness to you? AH: In a nutshell, enjoying life. Doing work that I love, that gives back to the community, exercising with friends, cooking great food and sharing with friends, learning and trying new things and laughing, laughing a lot. HH: Once again, thank you for taking the time to answer these question and congratulations on making the first gluten free health & wellness festival in Victoria, BC a reality. Now, I can’t finish this up without having some kind of recipe so the kind folks at Origin Bakery have given me a recipe to share. Whisk egg whites with honey and vanilla, just til combined. Whisk in coconut cream, then add coconut and salt and stir til combined. Scoop by tablespoonfuls onto greased or parchment-lined tray. Bake 8-10 minutes or til golden on top. Yields about 25 cookies, depending on size. Each cookies contains: 75 calories, 6.6 grams fat, 4.2 grams carbs, 1.3 grams fibre, and 1.2 grams protein. 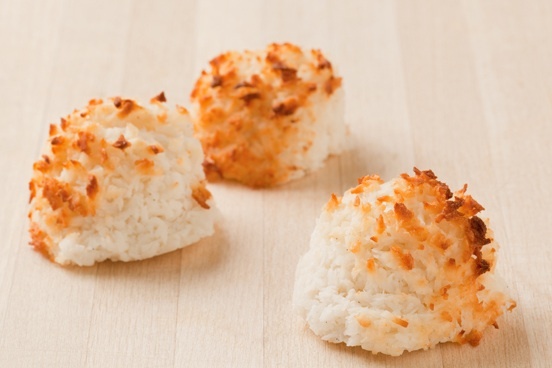 A tasty indulgence, my husband LOVES coconut macaroons. It’s one of my favourite things to send him in a care package when he is away.